Welcome to the official Syntax Demoparty (Australia) website. Syntax 2018 registrations are now open! A weekend of chilled fun is coming up fast on between the 10th and 11th of November. Clear your calendars! Join the fun of retro computing, modern-day coding, chip music, pixel graphics and DIY electronics projects. Registrations are now open! We are looking forward to seeing you for an exciting weekend. Syntax is a mini computer and technology festival known as a Demoparty. These weekend events occur globally and bring together programmers, musicians, graphic artists and tech creatives together to watch and often present works of art in a digital space. A popular combination of all these skills produces a "demo" - or a realtime animation that combines code + art in creative ways. While much of this is about modern computers, it also can include arduino-style and homebrew projects, olskool computers from the 80's and 90's and pre-rendered animations, graphics and music. Most importantly - things are very relaxed, everyone is welcome and it is a great place for people to be computer geeks of varying levels, graphics lovers or talk, musicians to talk software / chipmusic / tracker tools - everyone is into different things but we may as well all be in one room! (usually with a few beers later in the evenings). 2012 years party was also awesome with a bunch of peeps of all ages and backgrounds. 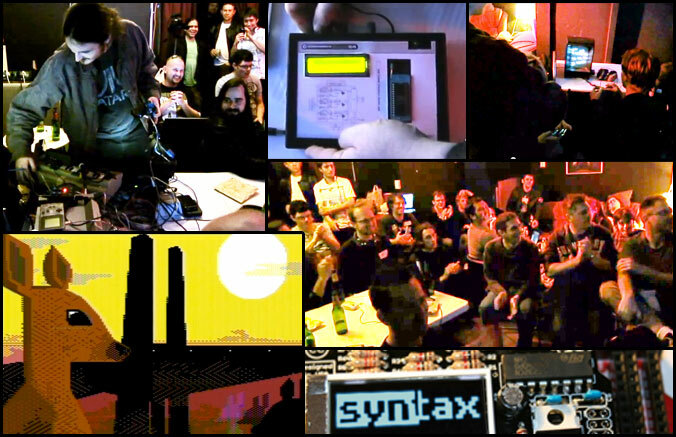 Checkout a video of TTT's amazing SID box and footage from the party at Syntax 2012 youtube vid. Syntax Past enteries have featured a huge variety of technology - all together under one roof. Site version 3.11 designed by Syntax Party Crew - Keeping the Aussie Demoscene Alive.